The Local Plan is open for consultation until 24 May 2019. It contains proposals for Bristol’s development over the next 20 years, including planning policy for homes, jobs and open spaces. Site allocations for development are detailed at ward level. Responses to the previous consultation are also summarised. 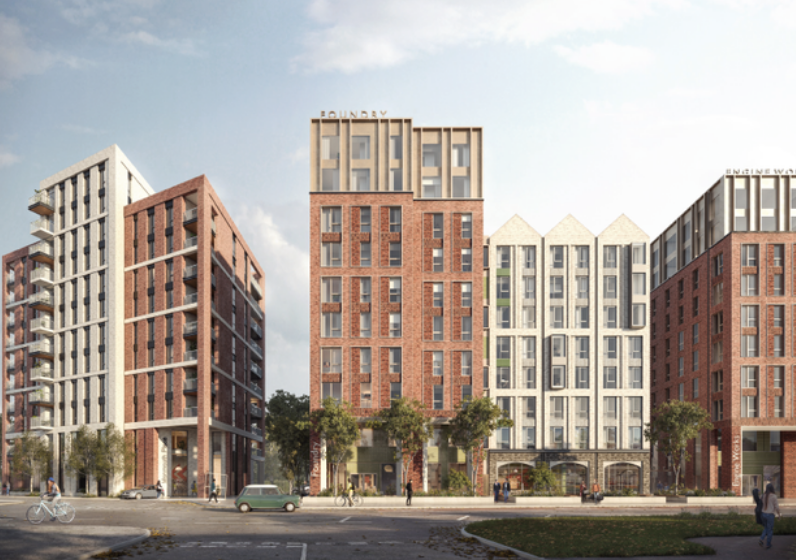 The framework for Bedminster Green, produced by Nash Partnership, was approved by Bristol City Council (BCC) in March 2019. It provides a framework for planning applications for each of the plots. Dandara has made a planning application for Plot 4 (Stafford St and Little Paradise). Proposals include 329 flats for rent to private tenants, a gym, a concierge and residents lounge. The height of the blocks ranges from 4 to 17 storeys. A small percentage of the 69 studio flats, 171 1-bed flats and 90 2-bed flats will be offered at ‘Affordable Private Rent’ (20% below market rent). Eighty-four parking spaces and 358 cycle spaces are included. Dandara is also working on high-rise housing plans for Plot 5, the Council-owned plot next to the station. a2Dominion now own Plot 1 (Malago Rd). The self-described ‘residential property group with a social purpose’ has submitted a planning application for homes for social rent and student accommodation (in collaboration with the University of Bristol). The proposals include accommodation for 550 students in six blocks (8 to 10 storeys) and 49 units of affordable housing (100% social rented) in a further block (10 storeys rising to 12 storeys). Four disabled car parking spaces, 163 cycle spaces and 2 drop-off areas are also included. Completion is scheduled for the 2021 student intake. 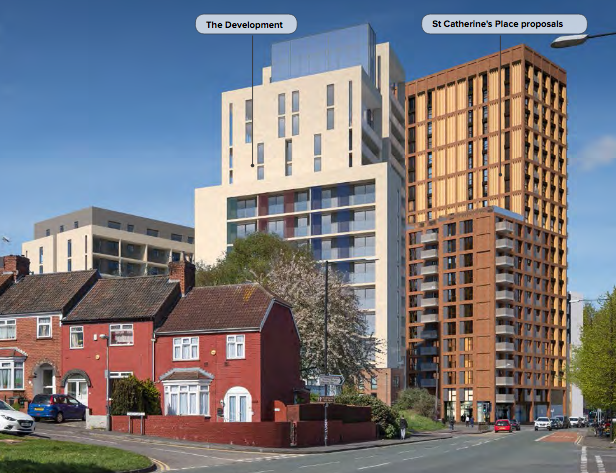 This will be the view from Alfred Rd if developers’ latest planning application goes ahead. Firmstone has put in a planning application for a major retail, residential and commercial development in several new blocks next to the refurbished block on St Catherine’s Place (Plot 2). The application includes no affordable housing – it does however contain a 3-screen Scott cinema! WHaM is co-ordinating a response – there have been over 200 objections from local residents already. 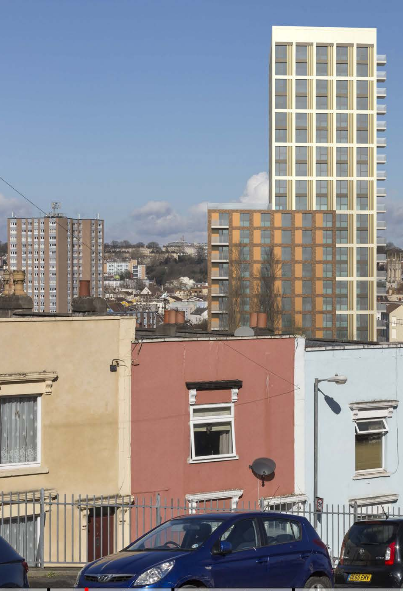 WHaM is an open-membership group which provides a platform for residents, developers, Bristol City Council and other stakeholders to discuss planning proposals for the area. We are part of the Neighbourhood Planning Network. WHaM welcomes development that prioritises community needs – we want to create a neighbourhood we can all feel positive about. WHaM’s current priority is consulting on proposals for developments in the Bedminster Green framework area. Find out who to contact with your views and how to get involved with WHaM.